First of all, Happy Easter to everyone who celebrates it! I remember back when I was a child that it was a big time of year for me. Every year my sisters and my mother and nana would go to a wonderful farm to paint eggs, roll them down the hill, ride on horses and look at baby chickens (and of course eat ALL of the chocolate eggs!) It was a wonderful time of year for me. Now that I am am older, I do not celebrate it like I used to but that is fine. I have fond memories that I will cherish forever. Since I now live in the Netherlands, a very typical thing to do for Easter is gourmetten. In this blog I will be talking about what and how to do it! All set up for gourmetten! Gourmetten is a very traditional way to eat in the Netherlands. It consists of a hot plate / grill with food that people cook in front of them at the table. There are many different types of gourmetten grilling sets. 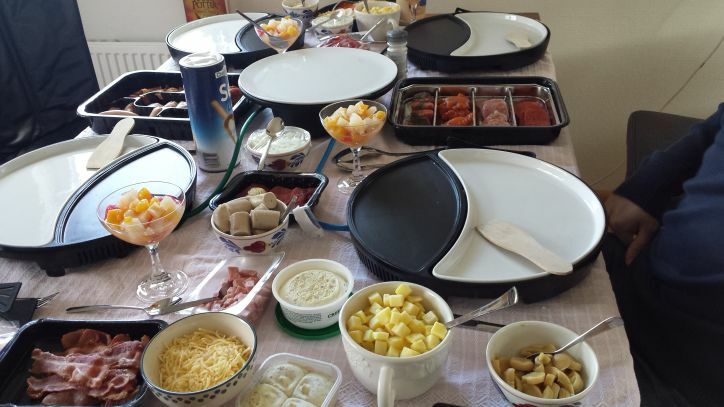 From a big griddle pan in the center of the table for everyone to use, to smaller individual gourmetten griddle plates. The one that I use the most is the individual one. In the two years of being in the Netherlands I have never used a big gourmetten pan. Individual ones work fine for me! A simple 1 man gourmetten dish! Black is the hot plate. White is the eating plate! It is very traditional to do gourmetten during certain times of year, usually during Christmas and Easter. Of course it is also acceptable to do gourmetten whenever! It is a great time for families to come together. 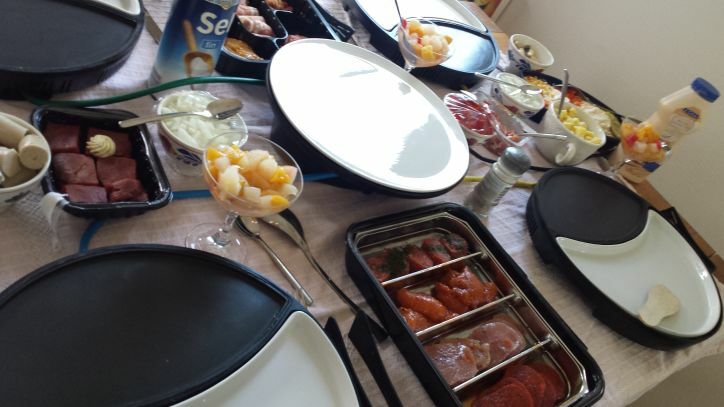 It is very common to buy trays of various meats called ‘gourmetten sets’. These would include meat such as chicken, beef, pork, fish (although fish is never on my gourmetten menu!) Vegetables such as paprika, mushrooms and onion are sliced up into small pieces and are dotted around the table in small bowls. Small potato squares are also very common during gourmetten. We also have pancake mix that can be carefully poured onto the griddle pan, and tends to be used for dessert (although we use it whenever.) Bread and kruidenboter (herb butter) or knoflookboter (garlic butter) is also common to have on the table to nibble on while the food on the pan/griddle is cooking. 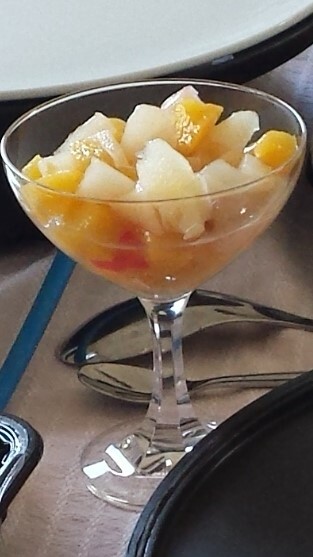 I am not sure if this is a normal thing, however whenever me and the partners family do gourmetten, we always a small cup/bowl filled with fruit cocktail. This I believe is a good ‘palette cleanser’ between cooked gourmetten food. Or at least that is what I use it for! It is rather refreshing to eat too. Also helps cool the mouth from the hot food! Gourmetten is very simple to do. If you are unsure about how to cook things, do not worry about it. There is no way that you can go wrong with this. As long as you watch your food and make sure that it is not sticking to the pan, it is fine! Everyone at the table tends to pay attention to everyones plate too, just in case you need to leave the table or you are not sure. I know the very first time I done gourmetten I was a little bit nervous. And I know how to cook well! First of all, you place the food onto the griddle pan of the gourmetten pan. 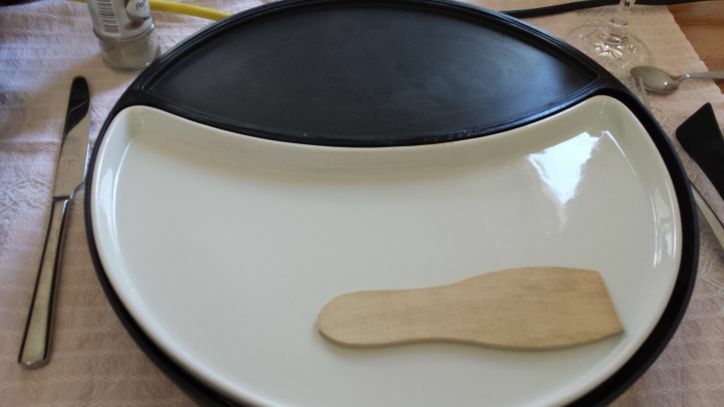 Black little tongs and a wooden spatula are used to toss around the food and turn the meats over until cooked to your liking. Finally you bring the cooked foods onto the plate and voila! You did gourmetten! 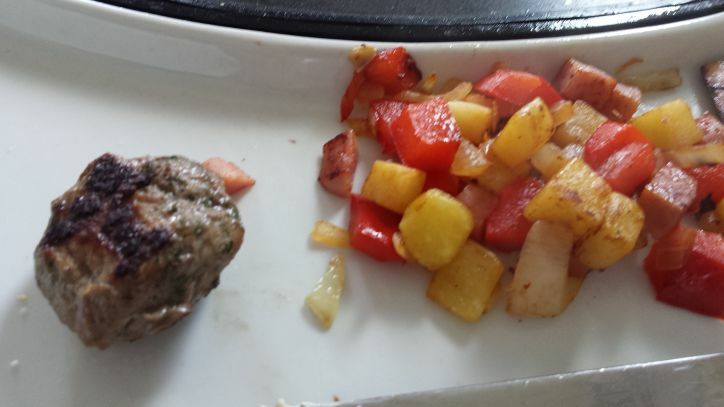 Burger with potatoes, red pepper, mushrooms and onion! It is really an experience dinner that I believe everyone should experience at some point in their life. The wonderful thing about it is that you can cook the food exactly how you like it. And you cannot complain if it is bad, because you cooked it! 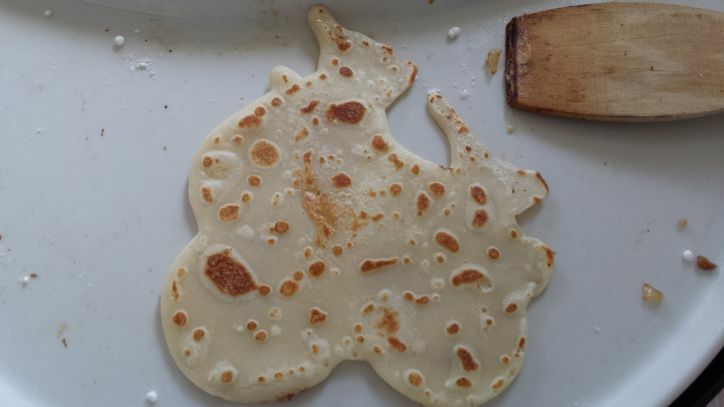 My pancake that turned out to look like a rabbit on a motorbike! 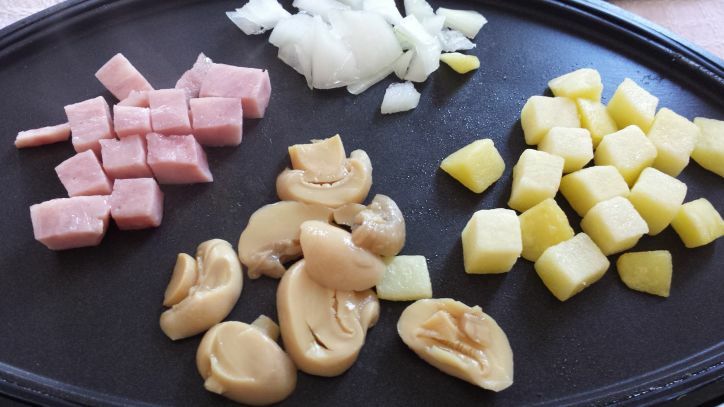 Whenever I do gourmetten, I always love having a bunch of potato blocks mixed together with paprika, mushrooms, onion and ham blocks. While cooking these, I cook either a piece of pork or beef. I then bring these all onto my plate and chow down. I always finish with a few little pancakes or a bigger pancake. It is rather fun to try and make patterns with the batter! Have you ever done gourmetten? If so, when do you tend to do it? If not, would you love to do it at some point in the future? Let me know! Looks yummy. I could do with these hot plates. We had roast lamb spiked with rosemary and garlic cloves with both mashed and roast potatoes. It was amazing! Previous Previous post: I went for an eye test. The results? 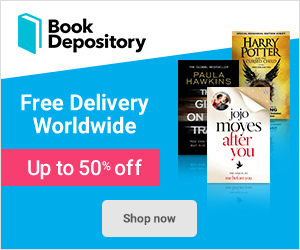 Next Next post: A Gathering of Shadows – Book Review!